Many of us will remember the pain of GCSEs (O-levels back in the day) – or will have children who are actively, and vocally, reminding them of it now. Many 16-year-olds getting their GCSE results today will feel like college or sixth form is their only option but – as you’ll see in today’s video – it’s never too early to pick a career, earn while you learn and make an active and worthwhile contribution to a business. If my PE GCSE is anything to go by, doing academia for the sake of it isn’t always a good idea. As today rolls to a close, teenagers around the country will be staring at a piece of paper and deciding the next step on their career paths. What many might not realise is that apprenticeships are a great option too. Apprenticeships are just as much about developing soft and transferable skills, which is great for any GCSE-ers who aren’t ready to go straight into employment but also know A-levels aren’t for them. The important thing is to strike a balance for teenagers who still want to learn and progress, but want to mix that in with developing in other ways too. The question is, does it work in practice? We spoke to two of our apprentices, Dylan and Josh, who joined us after finishing their GCSEs, to ask them about their time here. So, would he recommend it to anyone out there thinking that maybe they want to set a different course for themselves? In a word: yes. Josh, who is currently in the process of moving into our Windows team and shadowing the guys there, also loves the fact that you get more out of your learning from doing an apprenticeship. “You get commercial experience that you wouldn’t get in college, and to talk to people that are already in the industry who can provide you with invaluable knowledge that you wouldn’t learn anywhere else. You learn more than you would out of textbook because a textbook doesn’t update every 10 minutes! Josh knows that an apprenticeship opens doorways and provides the opportunity to go far. Take a look at these lovely lads in action in our video! Apprenticeships are crucial for the wider skills gap too, says Aaron: “Apprenticeships are critical in terms of filling the skills gap in the tech industry. We nurture and grow our own talent and we deliver an employment ready curriculum, fit for purpose. 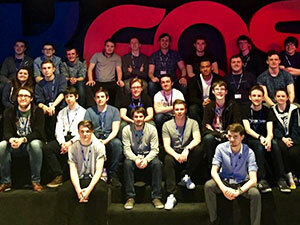 At UKFast we’re incredibly proud of our Apprenticeship Scheme; because of both our amazing training and education department and the superstar apprentices who’ve joined the team. We’re always looking for ways to improve it, and are looking into expanding the scheme into more departments as we grow. If this sounds like something that you – or someone you know – are interested in finding out more about, call us on 0161 215 4056.